Throughout October, in honor of Breast Cancer Awareness month, jcpenney is offering free haircuts and styles to all breast cancer survivors at their over 900 salons across the country. Survivors can visit their local jcpenney salon during operating hours for a complimentary cut, styling tips and a Sephora card good for a free mini lipstick and express service to complete the look. 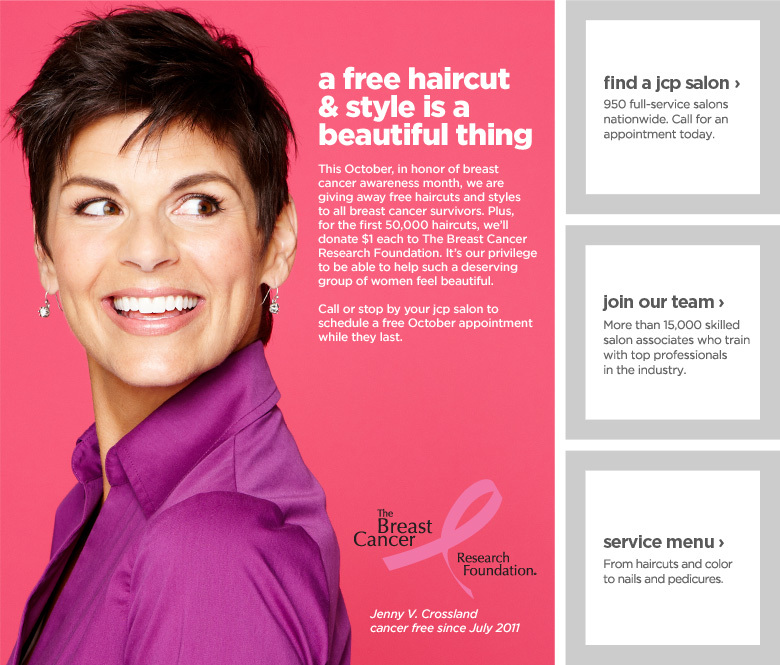 Additionally, jcpenney will donate $1 for every free haircut it gives – up to $50,000 – to The Breast Cancer Research Foundation. More than a century ago, James Cash Penney founded his company on the principle of the Golden Rule: treat others the way you’d like to be treated – Fair and Square. His legacy continues to this day, as J. C. Penney Company, Inc. (NYSE: JCP) boldly transforms the retail experience across 1,100 stores and https://jcp.com to become America’s favorite store. Focused on making the customer experience better every day, jcpenney is dreaming up new ways to make customers love shopping again. On every visit, customers will discover great prices every day in a unique Shops environment that features exceptionally curated merchandise, a dynamic presentation and unmatched customer service. For more information, visit us at https://jcp.com. The Breast Cancer Research Foundation®, founded by Evelyn H. Lauder in 1993, is an independent not-for-profit organization committed to funding scientific research to achieve prevention and a cure for breast cancer in our lifetime. In October 2012, BCRF will award $40 million to 197 scientists across the United States, Canada, Latin America, Europe, the Middle East, Australia, and China. With 91 cents of every dollar spent by BCRF directed towards breast cancer research and awareness programs, BCRF remains one of the most fiscally responsible charities in the country. For the tenth time since 2002, it has earned 4 stars from Charity Navigator. Additionally, BCRF is the only cancer organization rated an “A+” by CharityWatch. For more information about BCRF, visit https://www.bcrfcure.org.